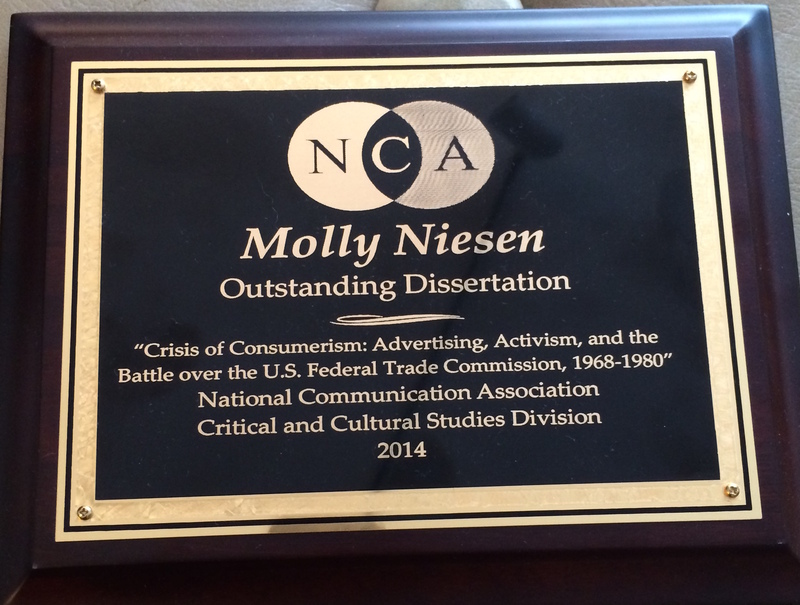 News from NCA – molly niesen, ph.d. It was with great pleasure that I participated in this year’s centenary of the National Communication Association‘s annual conference, held in late November in Chicago. It was an energizing experience to gather again with so many colleagues and friends dispersed around the globe for this event. While at NCA, I participated in the panel, “The Faces of Neoliberalism,” at which I delivered a paper entitled, “Economics (Re)education: Public Relations, Advocacy Advertising, and the Right to Rebuttal, 1976-1978.” This paper focuses on my work examining the Ad Council’s archives. Using trade press articles and a wide array of archival documents, I look at the how economics education became the cornerstone of corporate PR campaigns during the late 1970s. While at NCA, I was honored to receive the 2014 Best Dissertation Award from the NCA Critical and Cultural Division, my intellectual home base at NCA since I’ve been active in the organization. It was truly an honor to be selected this year, in the midst of an exceedingly strong pool of candidates. Receiving the award among so many colleagues and friends was a pleasure, and I extend my gratitude to the award’s adjudicators, to the chair and vice-chair of the Critical and Cultural division, and to all those who submitted work for consideration. Thanks so much again for this profound honor. Hope to see you next year! This entry was posted in Updates and tagged advertising, advocacy, awards, best dissertation, chicago, critical and cultural division, federal trade commision, national communication association, nca, neoliberalism, panel, papers. Bookmark the permalink.